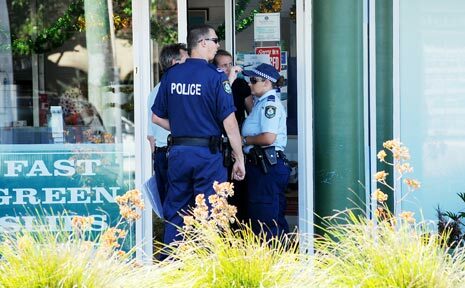 CRIME SCENE: Police at the Southern Cross Credit Union in Lennox Head in December 2008. A ROBBER who threatened the staff of credit unions at Lennox Head and Tweed Heads with a toy pistol last December was on parole for seven armed robberies in Queensland at the time. Kevin John Moore, 55, was yesterday sentenced in the Lismore District Court to 15 years jail, with a non-parole period of 10 years. Moore had pleaded guilty to two counts of armed robbery with a dangerous weapon - at Southern Cross Credit Union's Lennox Head branch on December 23, and its Tweed Heads branch on December 31. Moore pleaded guilty on June 6 to stealing $8924 during the robberies. 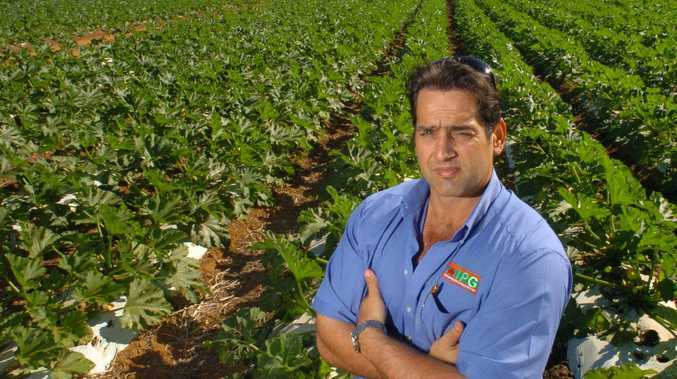 Moore committed the crimes only 19 months after his release from a Queensland jail where had served 10 years for armed robbery. The court heard he had rented a hire car to rob the credit unions, but replaced the car's number plates with stolen ones. During sentencing, Judge Black mentioned the 'highly creditable actions' of Brisbane tourist John Whitta, 62, who - after realising Moore's pistol was a fake during the Tweed robbery - crash-tackled him and, with the help of passers-by, held him for police. Moore's lawyer, Hugh van Dugteren, asked for a more lenient sentence of three years, saying Moore had been sexually assaulted by his Cub master as a young teenager, was estranged from his three children, had a gambling addiction and the relationship with his spouse had broken down. Mr van Dugteren also said that until six weeks ago Moore had never had the chance to read the victim impact statements of anyone affected by his crimes, nor was he given access to one-on-one psychological counselling during his Queensland jail time. Moore, who prior to becoming a robber worked for a bank and local authority, said he now realised what a 'traumatic experience' it had been for the credit union staff at a 'special time, Christmas'. He also told the court that he had used a toy pistol and not a real gun because 'I didn't want to hurt anyone. I didn't want anything to go wrong'. Moore's lawyer told the court that he believed the sexual assault by the Cub master resulted in Moore having a 'dysfunctional response to life'. A psychologist's assessment of Moore referred to in court said he was 'dissociated of normal human emotions in later life'. Moore said when he committed his crimes he 'switched off' and didn't think about the bank tellers' reactions. “I didn't think of the impact. I didn't want to know,” he said. Moore became teary in court as he told the judge his three children had refused to have anything to do with him after he was first sentenced in Queensland for armed robbery. Moore told the court he wanted personal psychological counselling to help him come to terms with his depression and gambling. Moore told the judge he had 'had enough of the havoc I cause in other people's lives'. On sentencing, Judge Black said he took into account Moore's guilty plea which was 'a great relief to those affected', but he described Moore's crimes as 'very grave offences with aggravated features'. He said he could not find that Moore would not reoffend. He also said the court assumed that people affected by such crimes would be traumatised and could be expected to feel 'nervous, edgy, jumpy and concerned' at work for an indeterminate amount of time. Moore will not be eligible for parole in NSW until 2018 and on release he will be extradited to Queensland to serve the remaining four years of a 14-year sentence he was paroled for in 2007.